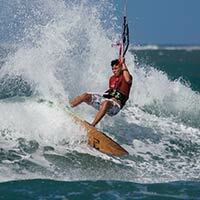 Riding a surfboard with a kite can be very different to the twintip you are probably used too. So before you head out to ride waves, do yourself a favour and understand the basics of how your kite and board work together. We'll start with the various ways to get you up and riding, then look at staying in control when under or overpowered and vitally staying on the board when getting out over waves. Please confirm that you'd like Progression to email you when the new Riding & Control Collection is available to purchase? You currently have an notification setup for the new Riding & Control Collection and Progression will send you an email to let you know when it is available to purchase.